FamilySearch has introduced Family Tree Lite. It is a streamlined version of FamilySearch’s Family Tree. This version is for users who need FamilySearch’s Family Tree to be smaller. Why would FamilySearch take something users love and make a smaller, minimalistic, version of it? One reason has to do with bandwidth. People who use FamilySearch’s Family Tree, but have limited internet bandwidth, may have problems. The full version might “bog down the connection”. Family Tree Lite doesn’t have “all the bells and whistles” of the original FamilySearch Family Tree. It is more accessible for people who have limited bandwidth. 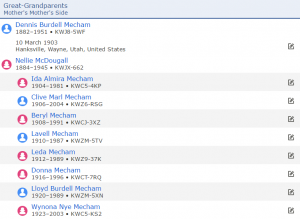 FamilySearch says that a simpler site means a faster, less frustrating, connection when bandwidth is limited such as in some countries or even just areas with less than stellar internet speed. Another reason why FamilySearch created Family Tree Lite is for mobile users who have to watch their data. Family Tree Lite uses less data than the original FamilySearch Family Tree does. People can use Family Tree Lite on their mobile devices, use less data, and potentially save some money. As you might expect, Family Tree Lite looks visually different than the regular FamilySearch Family Tree. The information is presented in a list instead of the usual tree format. It starts with the family in which you are the parent, and then continues to the family in which you are a child. From there, it lists your father’s family, then your mother’s family, and so on. 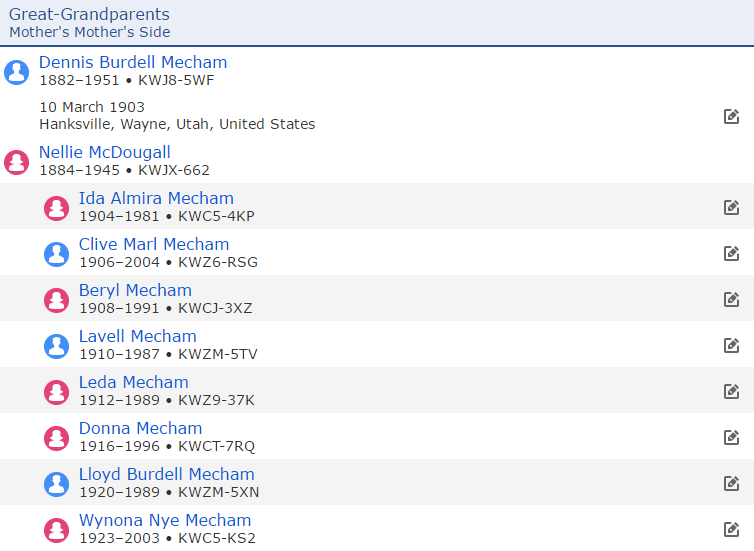 The original FamilySearch FamilyTree, with “all the bells and whistles” will remain available. It is not being replaced by Family Tree Lite. People who use Family Tree Lite, and want to access information about their family that it lacks, can check the full FamilySearch.org site. Family Tree Lite does have the capability to submit names to the temple. To see temple work that needs to be done, look for green temple icons. The icon will appear next to the names of individuals in your family tree who might need temple work done.